Add Rabbit IgG to my shopping cart. Request a quote for a bulk order for Rabbit IgG. Please fill out the form here below. Your local sales account manager will get in touch with you shortly and send you a quotation based on your requirements. The negative Ctrl IgG from rabbit has been extensively validated in chromatin immunoprecipitation assays (ChIP). It contains a spectrum of the IgG subclasses present in serum of healthy animals. 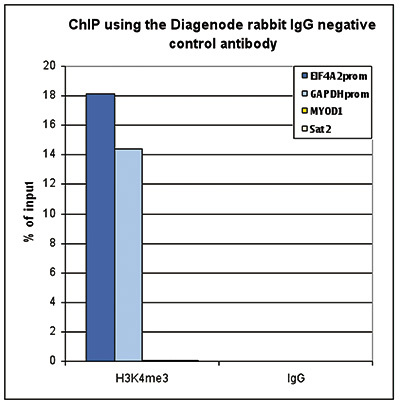 This IgG preparation is intended for use as a negative control in ChIP experiments for specific antibodies made in rabbit. The negative Ctrl IgG from rabbit should be used for ChIP in parallel with specific antibody at the same concentration as the specific antibody. It is included in our LowCell# ChIP kit (Cat. No. kch-maglow-A16) kit and available separately. ChIP assays were performed using the Diagenode rabbit polyclonal antibody against H3K4me3 (Cat. No. C15410003) and the “iDeal ChIPseq” kit (Cat. No. C01010051) on sheared chromatin from 1 million HeLa cells. Rabbit IgG (cat. No. C15410206) was used as a negative IP control. One μg of antibody per ChIP experiment was used for both antibodies. Quantitative PCR was performed with primers specific for the promoters of the active GAPDH and EIF4A2 genes, and for the inactive MYOD1 gene and the Sat2 satellite repeat. Figure 1 shows the recovery, expressed as a % of input (the relative amount of immunoprecipitated DNA compared to input DNA after qPCR analysis). HeLa cells were stained with the Diagenode rabbit polyclonal antibody against H3K4me3 (Cat. No. C15410003) (top) and with DAPI. Rabbit IgG (Cat. No. C15410206) was used as a negative control (bottom). Cells were fixed with 4% formaldehyde for 10’ and blocked with PBS/TX-100 containing 5% normal goat serum and 1% BSA. The cells were immunofluorescently labeled with the H3K4me3 or rabbit IgG negative control antibody (left) diluted 1:200 in blocking solution followed by an anti-rabbit antibody conjugated to Alexa488. 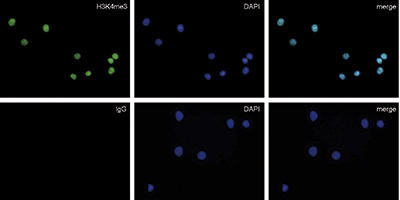 The middle panel shows staining of the nuclei with DAPI. A merge of the two stainings is shown on the right. In life sciences, epigenetics is nowadays the most rapid developing field with new astonishing discoveries made every day. To keep pace with this field, we are in need of reliable tools to foster our research - tools Diagenode provides us with. From antibodies to automated solutions - all from one source and with robust support. Antibodies used in our lab: H3K27me3 polyclonal antibody – Premium, H3K4me3 polyclonal antibody – Premium, H3K9me3 polyclonal antibody – Premium, H3K4me1 polyclonal antibody – Premium, CTCF polyclonal antibody – Classic, Rabbit IgG. Diagenode strongly recommends using this:	Rabbit IgG (Diagenode Cat# C15410206 Lot# RIG001S). Click here to copy to clipboard. Deletion of an intronic HIF-2α binding site suppresses hypoxia-induced WT1 expression. Differential Methylation of H3K79 Reveals DOT1L Target Genes and Function in the Cerebellum In Vivo. Loss of SETDB1 decompacts the inactive X chromosome in part through reactivation of an enhancer in the IL1RAPL1 gene. The Alzheimer's disease-associated TREM2 gene is regulated by p53 tumor suppressor protein. HIV-2/SIV viral protein X counteracts HUSH repressor complex. Epigenetic regulation of vascular NADPH oxidase expression and reactive oxygen species production by histone deacetylase-dependent mechanisms in experimental diabetes. Estrogen receptor α dependent regulation of estrogen related receptor β and its role in cell cycle in breast cancer. Reciprocal signalling by Notch-Collagen V-CALCR retains muscle stem cells in their niche. A new metabolic gene signature in prostate cancer regulated by JMJD3 and EZH2. The CUE1 domain of the SNF2-like chromatin remodeler SMARCAD1 mediates its association with KRAB-associated protein 1 (KAP1) and KAP1 target genes. Distinguishing States of Arrest: Genome-Wide Descriptions of Cellular Quiescence Using ChIP-Seq and RNA-Seq Analysis. EZH2 is overexpressed in adrenocortical carcinoma and is associated with disease progression. Expression of the MOZ-TIF2 oncoprotein in mice represses senescence. Largeot A, Perez-Campo FM, Marinopoulou E, Lie-A-Ling M, Kouskoff V, Lacaud G.
Identification of Critical Elements for Regulation of Inorganic Pyrophosphatase (PPA1) in MCF7 Breast Cancer Cells. The histone demethylase enzyme KDM3A is a key estrogen receptor regulator in breast cancer. A Distal Locus Element Mediates IFN-γ Priming of Lipopolysaccharide-Stimulated TNF Gene Expression. The cytokine TGF-β co-opts signaling via STAT3-STAT4 to promote the differentiation of human TFH cells. The interaction of MYC with the trithorax protein ASH2L promotes gene transcription by regulating H3K27 modification. Therapeutic targeting of BET bromodomain proteins in castration-resistant prostate cancer. Epigenetics of prostate cancer: distribution of histone H3K27me3 biomarkers in peri-tumoral tissue. Extensive amplification of the E2F transcription factor binding sites by transposons during evolution of Brassica species. Lysine-specific demethylase 1 regulates differentiation onset and migration of trophoblast stem cells. Progesterone receptor induces bcl-x expression through intragenic binding sites favoring RNA polymerase II elongation. Liver x receptors protect from development of prostatic intra-epithelial neoplasia in mice. Histone lysine trimethylation or acetylation can be modulated by phytoestrogen, estrogen or anti-HDAC in breast cancer cell lines. Inhibition of Tumor Promotion by Parthenolide: Epigenetic Modulation of p21. Genome-wide localization and expression profiling establish Sp2 as a sequence-specific transcription factor regulating vitally important genes. DNA methylation in an intron of the IBM1 histone demethylase gene stabilizes chromatin modification patterns. Dendritic Cells Activated by IFN-γ/STAT1 Express IL-31 Receptor and Release Proinflammatory Mediators upon IL-31 Treatment. C/EBPβ and RUNX2 cooperate to degrade cartilage with MMP-13 as the target and HIF-2α as the inducer in chondrocytes. Bivalent histone modifications in stem cells poise miRNA loci for CpG island hypermethylation in human cancer. Reciprocal repression between Sox3 and snail transcription factors defines embryonic territories at gastrulation. Disruption of the histone acetyltransferase MYST4 leads to a Noonan syndrome-like phenotype and hyperactivated MAPK signaling in humans and mice. Epigenetic profile of the euchromatic region of human Y chromosome. Inhibition of suppressive T cell factor 1 (TCF-1) isoforms in naive CD4+ T cells is mediated by IL-4/STAT6 signaling. Epigenetic regulation on the 5'-proximal CpG island of human porcine endogenous retrovirus subgroup A receptor 2/GPR172B. Epigenetic activation of SOX11 in lymphoid neoplasms by histone modifications. Survival motor neuron gene 2 silencing by DNA methylation correlates with spinal muscular atrophy disease severity and can be bypassed by histone deacetylase inhibition. Srivastava S, Sowpati DT, Garapati HS, Puri D, Dhawan J, Mishra RK.